Heraldry: I Love This Hobby! It’s been a while since I have had sufficient spare change to do something that I was able to do again recently. And that is to buy old heraldry books. I’ve been lucky enough to at times have sufficient funds – and a wife who doesn’t object* – that over the years I’ve been able to acquire for my personal heraldic library a fair number of books that are 100 or more, sometimes significantly more, years old. I’ve managed to acquire a copy of the fourth edition of Guillim’s A Display of Heraldrie, published in 1660 which has the wonky page numbering because while it was in the process of being printed, Charles II was restored to the throne of England, and they wanted to include such things as the Royal arms. My personal favorite remains a 1795 edition of Porny’s The Elements of Heraldry, which I pull off the shelf periodically not so much to read, really, but just to enjoy the feel of turning the pages. The paper has such a high linen rag content that the pages in it feel almost like cloth rather than paper. But, as I said, I recently had a bit of a personal windfall (money that wasn’t otherwise earmarked already), and so I went out to the Heraldry Today website (http://www.heraldrytoday.co.uk/ for those of you who haven’t run across this site already) and ordered, and have now received, the oldest book yet in my library, E.B. 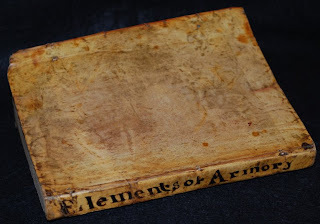 [olton]’s The Elements of Armories, published in 1610. I realized after it arrived in the mail that I’d forgotten how truly exciting it is to hold something in your hand that was in existence when James VI and I was on the thrones of Scotland and England, respectively. It’s not in mint condition (very few things that old are; there’s a little water spotting and some page discoloration), but I have every reason to believe that "look so good in  years [I] will not, hmm?" It also used to be owned by the late "H.S. 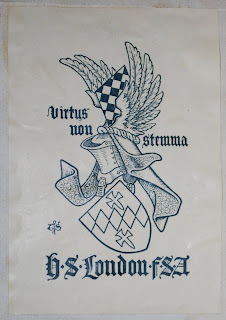 London, FSA", as witnessed by his bookplate, which makes it even more special, since he was at one time Norfolk Herald Extraordinary of the College of Arms in London. So is this a great hobby or what? I get to own bits of history that have their own special histories. That is just so cool! * There’s a reason she doesn’t object. She figures the odds are in her favor of outliving me, and the day I die, she intends to (1) put all of my heraldry books up for sale on eBay, and (2) notify all of my heraldry hobbyist friends that they’re out there, in order to finance her "grieving" trip to Venice, where she hopes to spend a fair bit of time with Vito the cabana boy getting over her recent loss. I randomly stumbled across your blog and I have to say.. Its presentation, look style and feel. Really grabs me. Im not big into hearldry but ill be leaving it in my bookmarks to read your posts on a daily basis. Thank you for making such a fine blog. Kinkout: Thank you for the kind words. It's nice to know that I'm having a positive impact. Anonymous: While I've read (and downloaded) a number of old heraldry books from both Google books and Internet Archive, which are especially useful for carrying about with me on my travels for heraldic research, sometimes there really is nothing quite like the feel, and even the smell, of an old book. I am very grateful that I've had the opportunity over the years to be able to acquire a few of these texts. David...can you put in a good word for me so that I can get first dibs on these books when you...um...move on? Wait, let me think about this.